GOPers need to talk about Ocasio-Cortez's Green New Deal 24/7. 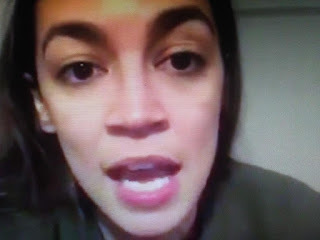 Fox News reports U.S. Rep. Alexandria Ocasio-Cortez, D-N.Y., lashed out at President Donald Trump on Monday after he ridiculed the freshman lawmaker’s controversial “Green New Deal” during a rally in El Paso, Texas. if you want to see the dow sink 400 every day for several MONTHS, institute this stupid agenda. this twit has been born, raised, and indoctrinated in the big city liberal cesspool. she has NO concept of how finance, the world in general, and this country specifically, works. she needs to do a road trip and find out how big this country is, and how hard the REAL working class work to keep it running. a month in the hinterlands of flyover country might make a dent in her stupidity, but I doubt it.